Hudspeth, J., Sanloup, C., Kono, Y. (2018) Properties of molten CaCO3 at high pressure. Geochem. Persp. Let. 7, 17–21. European Research Council, DOE- NNSA, DOE office of Science, DOE-BES/DMSE, National Science Foundation. Li, Z., Li, J., Lange, R., Liu, J., Militzer, B. (2017) Determination of calcium carbonate and sodium carbonate melting curves up to Earth’s transition zone pressures with implications for the deep carbon cycle. Earth and Planetary Science Letters 457, 395-402. ), which implies that the reported flattening of the melting curve followed by a slightly negative curve above 8 GPa cannot be due to crystal-melt density inversion. Instead, the enthalpy of fusion is likely responsible, and we note the peculiar high diffusivity of oxygen in crystalline calcite-V in this regard, with further implications for the mobility of carbonate melts at depth. Figure 1 (a) Structure factors, S(q), of molten CaCO3; curves are stacked to see better the evolution with increased P-T conditions (given on the right panel); the main change affecting S(q) (Fig. 1a) is the shift of the first sharp diffraction peak (FSDP) towards higher reciprocal distances, up to 2.28 Å-1 at 8.7 GPa which corresponds in the real space to a characteristic mid-range order distance, , of 2.76 Å. (b) Corresponding radial distribution functions (plain curves), g(r), compared to MD simulations (dashed curve; Vuilleumier et al., 2014). Figure 2 Density of molten CaCO3 from experiments (circles: this work, squares: Dobson et al., 1996) and theoretical calculations (Genge et al., 1995; Vuilleumier et al., 2014; Li et al., 2017), compared to the seismological PREM model (Dziewonski and Anderson, 1981), crystalline calcite V (Li et al., 2017), molten hydrous and dry rhyolite (Malfait et al., 2014), molten hydrous and dry basalt (Sakamaki et al., 2006). Figure 3 Bulk modulus of molten CaCO3 as a function of P (black: 1773 K, red: 1923 K, orange: 2073 K, orange empty circles: 1773 K and 1923 K data corrected for T = 2073 K). Jones, A.G., Genge, M., Carmody, L. (2013) Carbonate melts and carbonatites. Reviews in Mineralogy and Geochemistry 75, 289-322. Gaillard, F., Malki, M., Iacono-Marziano, G., Pichavant, M., Scaillet, B. (2008) Carbonatite melts and electrical conductivity in the asthenosphere. Science 322, 1363-1365. Foley, S.F. (2008) Rejuvenation and erosion of the cratonic lithosphere. Nature Geoscience 1, 503-510. Kono, Y., Sanloup, C. (2018) Magmas under Pressure: Advances in High-Pressure Experiments on Structure and Properties of Melts. Elsevier, Amsterdam, The Netherlands. Kohara, S., Badyal, Y.S., Kouray, N., Idemotoy, Y., Takahashi, S., Curtiss, L.A., Saboungi, M.-L. (1998) The structure of molten alkali carbonates studied by neutron diffraction and ab initio calculations. Journal of Physics: Condensed Matter 10, 3301-3308. Wilding, M.C., Wilson, M., Alderman, O.L.G., Benmore, C., Weber, J.K.R., Parise, J.B., Tamalonis, A., Skinner, L. (2016) Low-dimensional network formation in molten sodium carbonate. Scientific Reports 6, 24415. Liu, Q., Lange, R.A. (2003) New density measurements on carbonate liquids and the partial molar volume of the CaCO3 component. Contributions to Mineralogy and Petrology 146, 370-381. Liu, Q., Tenner, T.J., Lange, R.A. (2007) Do carbonate liquids become denser than silicate liquids at pressure? Constraints from the fusion curve of K2CO3 to 3.2 GPa. Contributions to Mineralogy and Petrology 153, 55-66. Dobson, D.P., Jones, A.P., Rabe, R., Sekine, T., Kurita, K., Taniguchi, T., Kondo, T., Kato, T., Shimomura, O., Urakawa, S. (1996) In-situ measurement of viscosity and density of carbonate melts at high pressure. Earth and Planetary Science Letters 143, 207-215. Kono, Y., Park, C., Kenney-Benson, C., Shen, G., Wang, Y. (2014) Toward comprehensive studies of liquids at high pressures and high temperatures: Combined structure, elastic wave velocity, and viscosity measurements in the Paris-Edinburgh cell. Physics of the Earth and Planetary Interiors 228, 269-280. ), with no P effect observed up to 6.2 GPa. This latter study also reported the structure of CaCO3 melts but information was restricted to distances greater than 2 Å, excluding the C-O bond. ). The flattening of the CaCO3 melting curve was attributed to a density crossover between solid and liquid CaCO3. However, such crossover is only predicted theoretically near 17 GPa, and this discrepancy was attributed to approximations in the ab initio calculations, highlighting the need for further experimental measurements of melt density. 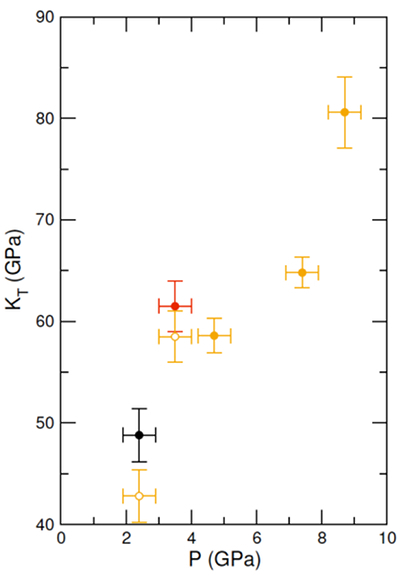 We report here structural and density data on molten CaCO3 from in situ X-ray diffraction up to 8.7 GPa and 2073 K, an experimental P-T range that corresponds to upper mantle conditions. Attempts to collect data on molten Na2CO3, K2CO3, and carbonate mixtures failed, and consequently no results are reported here for these compositions. This might indicate that these compositions have even lower viscosities than pure CaCO3 melt, resulting in escape of the molten carbonates from the graphite capsule. In situ energy-dispersive X-ray diffraction data were collected under high P-T conditions (Table S-1) using a Paris-Edinburgh press. The structure factor, S(q), was derived from the X-ray diffraction patterns (Supplementary Information, SI). The g(r) radial distribution function, a measure of the probability of finding an atom as a function of the radial distance r, was obtained by Fourier Transform of the spline smoothened S(q). Vuilleumier, R., Seitsonen, A., Sator, N., Guillot, B. 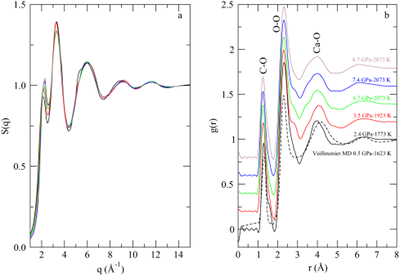 (2014) Structure, equation of state and transport properties of molten calcium carbonate (CaCO3) by atomistic simulations. Geochimica et Cosmochimica Acta 141, 547-566. MD simulations and our results supports their conclusions, i.e. the P-evolution of the liquid structure smoothes out the abrupt changes occurring across the underlying crystalline calcite V-aragonite transition. Oganov, A.R., Ono, S., Ma, Y., Glass, C.W., Garcia, A. (2008) Novel high pressure structures of MgCO3, CaCO3 and CO2 and their role in Earth’s lower mantle. Earth and Planetary Science Letters 273, 38-47. 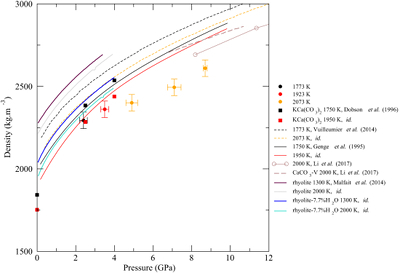 Pickard, C.J., Needs, R.J. (2015) Structures and stability of calcium and magnesium carbonates at mantle pressures. Physical Review B 91, 104101. Genge, M.J., Price, G.D., Jones, A.P. (1995) Molecular dynamics simulations of CaCO3 melts to mantle pressures and temperatures: implications for carbonatite magmas. Earth and Planetary Science Letters 131, 225-238. Egelstaff, P.A. (1994) An Introduction to the Liquid State. Oxford University Press, Oxford. Sanloup, C., Drewitt, J.W.E., Cr´episson, C., Kono, Y., Park, C., McCammon, C., Hennet, L., Brassamin, S., Bytchkov, A. (2013) Structure and density of molten fayalite at high pressure. Geochimica et Cosmochimica Acta 118, 118-128. Litasov, K.D., Shatskiy, A., Gavryushkin, P.N., Bekhtenova, A.E., Dorogokupets, P.I., Danilov, B.S., Higo, Y., Akilbekov, A.T., Inerbaev, T.M. (2017) P-V-T equation of state of CaCO3 aragonite to 29 GPa and 1673 K: In situ X-ray diffraction study. Physics of the Earth and Planetary Interiors 2654, 82-91. Redfern, S.A.T., Angel, R.J. (1999) High-pressure behaviour and equation of state of calcite, CaCO3. Contributions to Mineralogy and Petrology 134, 102-106. Sakamaki, T., Suzuki, A., Ohtani, E. (2006) Stability of hydrous melt at the base of the Earth’s upper mantle. Nature 439, 192-194. Malfait, W.J., Seifert, R., Petitgirard, S., Perrillat, J.-P., Mezouar, M., Ota, T., Nakamura, E., Lerch, P., Sanchez-Valle, C. (2014) Supervolcano eruptions driven by melt buoyancy in large silicic magma chambers. Nature Geoscience 7, 122-125. ), with a similar P-evolution (although the latter has only been investigated up to 4 GPa). Dziewonski, A.M., Anderson, D.L. (1981) Preliminary reference Earth model. Physics of the Earth and Planetary Interiors 25, 297-356. Suito, K., Namba, J., Horikawa, T., Taniguchi, Y., Sakurai, N., Kobayashi, M., Onodera, A., Shimomura, O., Kikegawa, T. (2001) Phase relations of CaCO3 at high pressure and high temperature. American Mineralogist 86, 997-1002. Ishizawa, N., Setoguchi, H., Yanagisawa, K. (2013) Structural evolution of calcite at high temperatures: Phase V unveiled. Scientific Reports 3, 2832. Goncharov, A.F., Sanloup, C., Goldman, N., Crowhurst, J.C., Bastea, S., Howard, W.M., Fried, L. E., Guignot, N., Mezouar, M., Meng, Y. (2009) Dissociative melting of ice VII at high pressure. Journal of Chemical Physics 130, 124514. Bulanova, G.P., Walter, M.J., Smith, C.B., Kohn, S.C., Armstrong, L.S., Blundy, J., Gobbo, L. (2010) Mineral inclusions in sublithospheric diamonds from Collier 4 kimberlite pipe, Juina, Brazil: subducted protoliths, carbonated melts and primary kimberlite magmatism. Contributions to Mineralogy and Petrology 160, 489-510. Hammouda, T., Keshav, S. (2015) Melting in the mantle in the presence of carbon: Review of experiments and discussion on the origin of carbonatites. Chemical Geology 418, 171-188. Thomson, A.R., Walter, M.J., Kohn, S.C., Brooker, R.A. (2016) Slab melting as a barrier to deep carbon subduction. Nature 529, 76-79. Korsakov, A.K., Hermann, J. (2006) Silicate and carbonate melt inclusions associated with diamonds in deeply subducted carbonate rocks. Earth and Planetary Science Letters 241, 104-118. ). Freezing of melts entrained in a plume might then explain the complex, broken and heavily deformed shapes of deep diamonds, indicating formation in a very viscous environment. Density and structural data are yet to be collected on other carbonate melts, including alkali compositions, in order to assess the properties of all natural compositions. This will require using faster density/structural probes, due to the challenge of confining such inviscid and highly reactive melts under pressure. We acknowledge funding from the European Community’s Seventh Framework Programme (FP7/2007-2013) under grant agreements no. 312284 and 259649 (European Research Council starting grant to C.S.). High pressure experiments were performed at HPCAT (Sector 16), Advanced Photon Source (APS), Argonne National Laboratory. HPCAT operation is supported by DOE-NNSA under Award No. DE-NA0001974, with partial instrumentation funding by NSF. The Advanced Photon Source is a U.S. Department of Energy (DOE) Office of Science User Facility operated for the DOE Office of Science by Argonne National Laboratory under Contract No. DE-AC02-06CH11357. Y. K. acknowledges the support of DOE-BES/DMSE under Award DE-FG02-99ER45775 and support by the National Science Foundation under Award No. EAR-1722495. We acknowledge O. Boudouma for help with SEM analysis, and C. Kenney-Benson for providing cell-assembly parts. 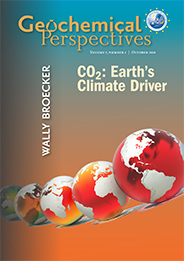 We thank an anonymous reviewer and T. Hammouda for thoughtful reviews of the manuscript. Corresponding geodynamical settings could be slab-derived melts entrained in upward plumes rising from the transition zone, as proposed for the generation of deep diamonds (Bulanova et al., 2010). The nature of deep diamond inclusions also points to the presence of Ca-rich protoliths or calcic melts at depths exceeding 300-350 km (Korsakov and Hermann, 2006; Bulanova et al., 2010). In situ high P density measurements are restricted to two P points for molten K2Ca(CO3)2 (2.75 g∙cm-3 at 2.5 GPa-950 ℃, 2.58 g∙cm-3 at 2.5 GPa-1150 ℃, and 2.80 g∙cm-3 at 4 GPa-1050 ℃) using the falling sphere technique (Dobson et al., 1996). These first in situ density measurements were complemented by a study of the viscosity of K2Ca(CO3)2 and K2Mg(CO3)2 melts up to 5.5 GPa (Dobson et al., 1996). An alternative method to assess KT (Egelstaff, 1994) is by extrapolating S(q) to q = 0 Å-1 (Fig. S-2 and SI) as , where kB is Boltzmann’s constant. As such, the properties of carbonate melts are key in processes ranging from incipient melting at the oceanic lithosphere-asthenosphere boundary and lubrication of tectonic plates (Gaillard et al., 2008), to pervasive metasomatism of the continental lithospheric roots (Foley, 2008). The calculated density values are consistent with MD simulations by Genge et al. (1995), although the mismatch with more recent simulations (Vuilleumier et al., 2014) is larger, but seems to be in agreement with ab initio calculations from Li et al. (2017). Resulting KT values are provided on Figure 3, along with a correction of the two lowest P points to the 2073 K isotherm using dKT/dT = 0.02 K-1 from Genge et al. (1995). Similarly, a strong increase of the melting enthalpy ΔH (i.e. TΔS) of water has been measured above 15 GPa and up to the ice VII-superionic ice X transition, associated with enhanced diffusion of H atoms in the liquid (Goncharov et al., 2009). Deep carbonate melts cannot indeed derive from melting in the peridotite + CO2 system but from subducted carbonaceous sediments or from metasomatised eclogites (Hammouda and Keshav, 2015), keeping in mind that carbonatitic melts produced above 15 GPa get Mg-enriched while Ca-rich melts (Ca# = 0.68-0.70) are reported in the 8-14 GPa range (Thomson et al., 2016), coincidental to the negative CaCO3 melting slope. Calcite V has a very peculiar molecular structure, with the oxygen sublattice being molten and the oxygen atoms diffusing along an undulated circular orbit (Ishizawa et al., 2013). The geological importance of carbonate melts is linked to their low melting points compared to silicates, and hence their key role in triggering melting at depth (Jones et al., 2013). Structural data at ambient P have been collected on Li2CO3, K2CO3, LiKCO3 melts using neutron diffraction (Kohara et al., 1998), and Na2CO3 using X-ray diffraction (Wilding et al., 2016). This contrasts with the advances in knowledge on silicate melts under P over the last decade, as reviewed in Kono and Sanloup (2018), and is due to the extreme difficulty in confining such low-viscosity melts for long durations. The ultralow viscosity, i.e. two orders of magnitude lower than for molten basalt at 1900 K, was nonetheless confirmed for calcite and dolomite melts (Kono et al., 2014), with no P effect observed up to 6.2 GPa. It appears this does not affect the viscosity of the melt vs. P (Kono et al., 2014), as the latter is controlled by the diffusivity of the cations. These are the first direct density measurements of compressed CaCO3 melt; they agree well with recent ab initio predictions (Li et al., 2017), which implies that the reported flattening of the melting curve followed by a slightly negative curve above 8 GPa cannot be due to crystal-melt density inversion. Of particular interest is the report of a flattening of the CaCO3 melting curve at 8 GPa followed by a slightly negative slope up to the calcite-aragonite-melt triple point at 13 GPa (Li et al., 2017). This evolution is unique amongst carbonates, with stronger and positive slopes reported for Na2CO3 and MgCO3 (Li et al., 2017). Our results confirm the liquid density of CaCO3 estimated from ab initio calculations (Li et al., 2017). There is no experimental data on the thermal equation of state of calcite V due to its very limited T-stability field (<200 K) and strong recrystallisation processes at high T (Suito et al., 2001), but the good agreement between experimental and theoretical estimates of liquid density lends support to theoretical calcite V equation of state (Li et al., 2017). Density crossover between solid and liquid phases may hence only occur at 17 GPa as predicted (Li et al., 2017). 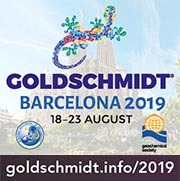 At 8.7 GPa, the bulk modulus (80.6 ± 3.5 GPa) is identical to that of crystalline aragonite (79.5-81.3 GPa) using KT,0, K’ and dKT/dT values provided in Litasov et al. (2017), and although no high T data are available for calcite V, KT,0, K’ for aragonite is similar to that of calcite I (Redfern and Angel, 1999). The effect of P on melt compaction, i.e. the bulk modulus, has been assessed for alkali carbonate melts by combining ambient P density and acoustic velocity measurements (Liu and Lange, 2003), and from the melting curve for K2CO3 (Liu et al., 2007). Compared to silicate melts (Fig. 2), molten CaCO3 is less compressible than basalt (Sakamaki et al., 2006) especially at high P, but is only approximately 5 % less dense than hydrous rhyolite (Malfait et al., 2014), with a similar P-evolution (although the latter has only been investigated up to 4 GPa). C is coordinated by three O in the studied P-T range, but C becomes tetrahedrally coordinated above 50 GPa in crystalline MgCO3 (Oganov et al., 2008) and above 76 GPa in crystalline CaCO3 (Pickard and Needs, 2015). This method has been previously benchmarked for molten fayalite using the same experimental set up (Sanloup et al., 2013). These observations are consistent with the shrinkage of interatomic distance, most pronounced for Ca-Ca (from 4 Å at ambient P), and increase in intensity predicted for both contributions by molecular dynamics (MD) calculations (Vuilleumier et al., 2014), as a result of intermolecular packing upon compression. However, correspondence between Vuilleumier et al. (2014) MD simulations and our results supports their conclusions, i.e. the P-evolution of the liquid structure smoothes out the abrupt changes occurring across the underlying crystalline calcite V-aragonite transition. Figure 1 [...] (b) Corresponding radial distribution functions (plain curves), g(r), compared to MD simulations (dashed curve; Vuilleumier et al., 2014).